Our Equipment Library features a Sheffield CMM (coordinate measurement machine) shop floor inspection machine. It is a dimensional measurement machine allowing inspection to occur right at the point of production, on the shop floor. It is currently in use at Fala Technologies for corporate training purposes. It is also available for use by eligible small to medium sized manufacturers and entrepreneurs on a per needs basis (to apply for use, please use the form at the bottom of the page). 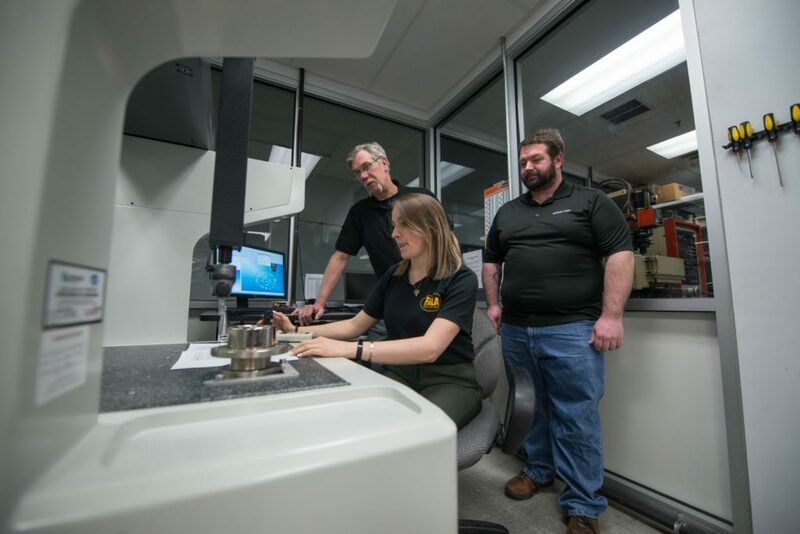 T-SEC’s partner, Fala Technologies, currently uses the The Discovery CMM from Sheffield at their on-campus SMARTT Lab to teach classes in sophisticated equipment use. One such class is the GD&T (Geometric Dimensioning and Tolerancing) course taught through Fala’s partnership with Ulster Community College’s Development Center for Business where customized training courses are made available for regional corporate and small business customers. Fala Technologies is on the frontline of the constant iteration of improving manufacturing technique in the Hudson Valley, and sharing that knowledge. One key development in that iteration is the emerging The New York State Manufacturing Intermediary Apprenticeship Program as described here. In the Hudson Valley region, the Apprenticeship Training for the Advanced Manufacturing cluster is being coordinated by Fala Technologies , an official sponsor of the Apprenticeship program of New York State, in partnership with The Council of Industry under the auspices of MACNY.ORG , the Manufacturer’s Alliance and The New York State Department of Labor. Fala Technologies program training CNC Machinists, Electronics Technicians, and Maintenance Mechanics, among other tradesman, will use the CMM as a part of the rigorous apprenticeship training program begun in 2017 and expanding through 2018 and beyond. Interested in using the CMM? Want to take a class? If you would like to use the CMM at Fala Technologies kindly use the contact form to the left to let us know, and we will respond promptly. If you are interested in the Apprenticeship program or in taking or offering your staff courses available at Fala Technologies, you may also contact us using the same form. We look forward to hearing from you no matter what your interest!